Piezo.com has a large number of standard products of which can be shipped within 2 business days. But often engineers have an exact configuration or size they need for their design that is not one of our standard products. Our unique production capabilities allow us to make any combination of piezo and shim materials. Furthermore, our cutting and dicing capabilities allow for any size, specified to the nearest thousandth of an inch (tolerance is +/- 0.005" or +/- 0.1 mm). Our production team can also machine a center access patch and/or solder wires for easy integration in your design. This article is to help explain the different options you can chose from in building your custom design. These custom product-builds are charged per lot, not per part. A lot is defined as the 2.85" x 2.85" (72.4 x 72.4mm) square of ceramic we start from. Many of our standard products start with this same square ceramic size, then it is bonded with a center shim, and finally, it is cut and diced to size. For some customers and products a follow-on step is included for adding wires and access to the center shim. 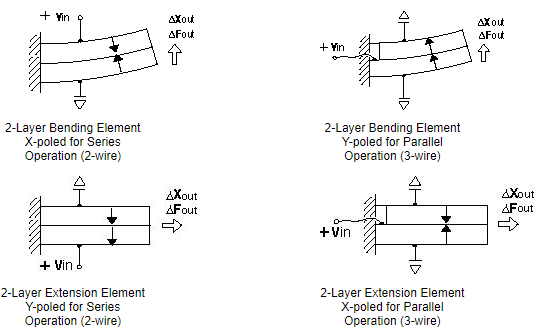 Because of these various steps needed for an end piezo multi-layer part, we must look to utilize the full amount of piezoelectric material that we start from. Any additional material is scrapped, and we believe it is best for both us and our customer to receive a full run of production prototypes. Depending on size of the end product needed, a lot can range in quantity from 1 to 529 units. The final size you need dictates this quantity. Any lot size of less than 10 will guarantee 100% yield, at 10 or above we allow for 10% loss although we will deliver all good finished parts. And per part charges are only applied to the minimum quantity guaranteed. Although we have a full 2.85" square, 0.1" around the border is cut away and 0.015" is needed per cut for the blade width. The calculator takes this into account in building your custom part. The custom builder quotes in lot charges. If you need a specific number of end products that doesn't perfectly equate to an equal number of lots, you will receive extra parts and need to pay for the full production lot charge. We prefer to not be wasteful with piezoelectric ceramic! When building your product you have several different parameters and options to chose to make the unit meet your needs. PZT 5H is an industry type 5H (Navy Type VI) piezoceramic. It has a high motion/volt and charge/newton rating, which is useful when voltage or force is limited. Thin vacuum sputtered nickel electrodes produce extremely low current leakage and low magnetic permeability. However, its temperature range is more limited and its properties are more sensitive to temperature. PZT 5A is an industry type 5A (Navy Type II) piezoceramic. Thin vacuum sputtered nickel electrodes produce extremely low current leakage and low magnetic permeability. 5A has a wide temperature range and is the most insensitive to temperature variations. 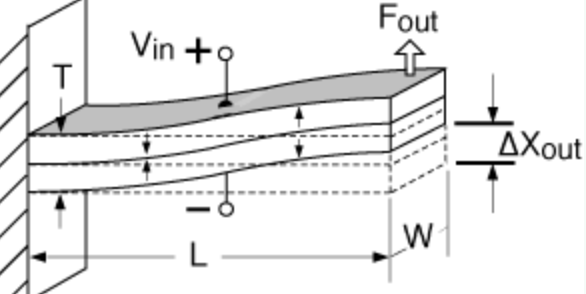 This defines the thickness in mils (thousandths of an inch) of each piezo layer. The higher thickness will offer more force but lower displacement and vice versa. There are three options: 0.005", 0.0075", and 0.010" (0.127, 0.191, 0.254 mm). A thickness of 0.0075" is the most popular in our standard products and offers the best tradeoff in performance. Chose from a single layer or a bimorph. A bimorph (2 layer) has a higher cost, but offers much more durability and performance. When choosing a multi-layer configuration you also have the option of selecting the center shim material that is between the two piezo layers. This center shim is necessary if you would like to access the center for parallel operation. No Shim - Potentially useful to reduce the thickness and can theoretically improve displacement; but in general this is not recommended because they have reduced reliability. Brass - Our most popular and what our standard products use due to it being non-magnetic. Carbon Fiber - High-performance shim offers high motion, force, and response rates but they need to be operated in series. Stainless Steel - High strength and reliability over other material options. Non-Magnetic - Brass with silver to eliminate the magnetism of the material. There are three options for the direction of motion. More information on the modes and how geometry impacts performance visit our Introduction to Piezos Guide Book. Bender - The multilayer piezo transducer will have the two piezos out-of-phase with one another to induce a bending motion as an actuator and be most sensitive to that motion as a sensor. Extender - The multilayer piezo transducer has both piezo elements in-phase for applications where it is bonded to a surface or attempting to measure strain. S-Bender - Similar to a bender but the beam is divided in two regions to move in a "S" shape. This is beneficial to ensure that the end moves up and down in parallel to the base. A picture of the motion is provided below. S-Benders are difficult to manufacture and therefore require an additional $1,000 lot charge. You can select to have the transducer poled for series operation (2 wires) or parallel (3-wires). Series will require a higher voltage but less current than parallel in actuation and output higher voltages but less current than parallel. If parallel operation is desired there will be an additional $10 charge per unit to access the center layer. The following graphic helps illustrate the poling and wiring contribute to control the direction of motion of the piezo. Also note that S-benders are in series. You can specify the length and width of your end size down to 0.001" (1 mil or thousandth of an inch) or 0.1 millimeter (mm). Keep in mind however that the final dimensions are to a tolerance of +/- 0.005". You are limited to a length and width of 2.85" (72.4 mm) as a maximum, and 0.1" (2.5 mm) as a minimum for handling. Please note that anything above 2.65" (67.3 mm) will be rounded to 2.85" because there isn't enough material for cutting fixtures. Piezoceramic can be very difficult to solder to, so select this option to have us conveniently solder and attach flying leads. There is a $10 per unit cost for this option. Piezoceramic typically comes with electrodes for wiring. But some applications require electrodes removed which we can do on a per lot/sheet basis. There is a $150 per lot cost for this option. Small mounting PCBs can be added on either side of the piezo beam to assist with integration. There are only four widths, 0.125", 0.25", 0.5", and 1.25" and the customizer will truncate the entered width to one of these options if mounting is desired. This will increase costs per piece of $20 for a quick mount and $40 for adouble-quickk mount. The cost starts at $150 per lot for a single uncut sheet. Then there is a $500 charge for cutting per lot and $350 charge for a 2 layer construction (requires additional material and bonding). A typical lot charge is $1,000 that includes cutting a specific rectangle of any arbitrary size between 0.1" and 2.85" (2.5 to 72.4 mm). Then there is an additional $5 per part charge for wiring and center access. This is only charged on the minimum guaranteed quantity. The typical lead time for a custom piezo product build is 5 business days because we have all the necessary materials in stock. For particularly small end units (quantities above 100 from the initial square) we may need to send the ceramic out-of-house which can extend the lead time by 5 to 10 business days. To order the custom configuration, simply fill out the form on the page with the part number that is generated and the lot quantity you need. Our team can generate a custom shopping cart for you to check out with and complete the order.